Wild Atlantic – Get Away – Eat. Stay. Play. Located on the Skellig Coast in the Southern Peninsulas of the Wild Atlantic, Valentia Island is one of Ireland’s most westerly points. The island neighbours the Ring of Kerry, and is linked to the mainland by the Maurice O’Neill Memorial Bridge at Portmagee. It is both historically, and culturally one of the most ancient lands in the world. The small, coastal island was the birthplace of global communications; receiving the first commercially viable transatlantic telegraph cable over 150 years ago. The cable station was one of the first global hubs for communication and created an original line of communication between Europe and North America. Valentia Island is also home to one of the earliest records of tetrapods in the world. Tetrapod tracks made over 350 million years ago, affirm the value of the island as a geological heritage site. Explore the island on foot, or more effortlessly by car or bike. The bus route from Farranfore to Killarney, extended by the daily buses that service South Kerry will get you to island if you haven’t rented a car for your trip. The Lighthouse at the Cromwell fort is one of the Great Lighthouses of Ireland and a must see while visiting the island. Tours are part of a community initiative delivered by the Valentia Island Development Company and views from the lighthouse balcony are guaranteed to blow you away. If Ancient Ireland interests you, why not pay homage to the island’s ancient Cairns Dolmens, Wedge tombs, Standing Stones, Ogham Stones and beehive huts? For those looking for a quaint, local eatery that houses an enchanted garden and a fairy tale bookshop, Knightstown Coffee Shop and Bistro is the hidden gem of Valencia Island. A hillfort perched atop the 244m high Greenan Mountain, this ancient Donegal site is believed to have been the seat of the kings that ruled the area known as the ‘Kingdom of Aileach’. The site is now a National Monument consisting of a seventh century massive stone ringfort; aileach is the Irish for ‘rocky place’. The highest point of Grianán of Aileach is a vantage point to take in the breathtaking, panoramic views of Donegal, and the surrounding counties. Views from the stone fort capture the glistening waters of Lough Foyle and Lough Swilly. This neolithic settlement is steeped in Irish mythology with link to Tuatha Dé Danann - Tribe of the Gods. The tribe worshiped ‘An Dagda’; a chieftain and druid associated with fertility, agriculture, wisdom, and strength. It was believed that ‘An Dagda’ ordered the building of the stone fort, to act as a burial monument to his deceased son. Spoken word encouraged people to believe that St. Patrick visited the religious site in the fifth century, and baptised the local chieftain. To reach the great fort by car, from the main N13 Letterkenny-Derry Road, look out for Burt Castle, the unusual contemporary church spire, and for local signage for An Grianán of Aileach. Follow local roads to the hillside site. The small fishing village synonymous with big waves has recently been named one of the top five surf spots on the planet. Surfers from South Africa, Hawaii, even as far as Australia come to Mullaghmore Head to ride the massive barrels. Many come for ‘prowlers’ – a famous spot where swells can reach up to 30m – and practice the towing technique involving jet skis. Mullaghmore Head is right on the edge of the ocean, Sliabh Liag sat on its cusp. 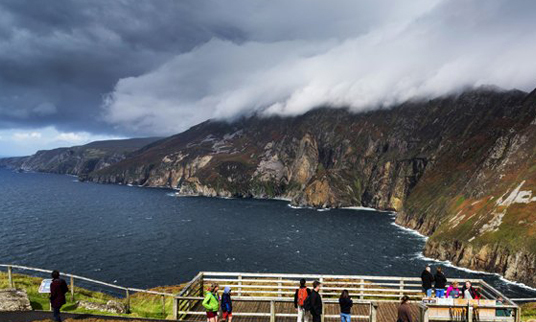 The Sliabh Liag mountain, although less renowned than the Cliffs of Moher in Clare, has cliffs that are almost three times higher than that of its Clare counterpart. 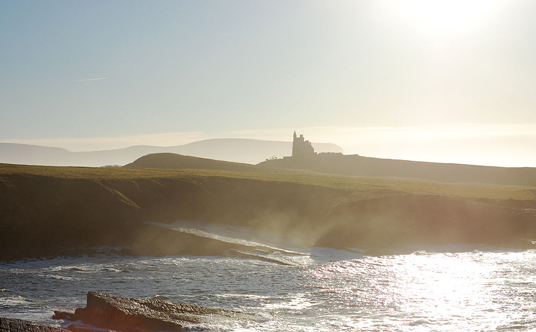 Enjoy sandy beach walks stretching as far as the eye can see and explore every bay, every beach along the Sligo coastline. Leaving with salt in your hair and sand between your toes means a day was well spent at the magnificent Mullaghmore Head.